Here is the story of a very interesting coin, told to me by Bruce Lorich, an acknowledged expert on English coins. 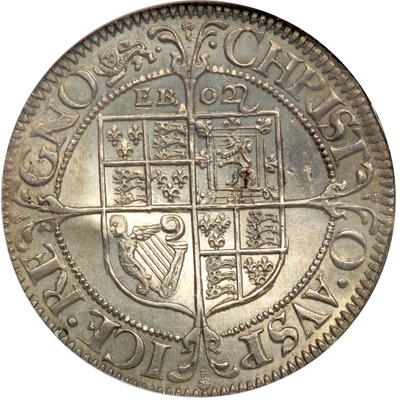 It is about an English shilling from the reign of Charles I, minted at York by Nicolas Briot in 1643-4. The shilling was found in a Jacobean chest of drawers, stuck somehow in the back of one of the drawers, somewhere in the English north country back in the early 1980s. It was seemingly lost in the piece of furniture just after it was minted over 350 years ago. The coin is a gem, with full luster, and is almost certainly the finest of its kind known to exist. The dealer who first acquired the shilling was a dear friend of Mr. Lorich (Bruce hereafter) who often traveled around the English countryside looking for coins, banknotes and other historical relics. He had never seen such a marvelous shilling and saved it, knowing Bruce would treasure it as well. Bruce kept it for nearly 20 years before selling it to an avid shillings collector. It later resurfaced at a Goldberg auction in a plastic holder, inexplicably graded MS 63 by the Numismatic Guaranty Corporation (NGC), despite its fabulous silvery luster and freshness, probably due to the small area in the center of the coin that is actually the result of an alloy flaw rather than a poor strike, mishandling or wear. (The red area seen in the center of the shilling is actually red wax, classically used for marking such flaws, and may have been placed there by the original finder in the early 1980s.) Who holds the coin now is unknown. Spink’s Standard Catalog of British Coins assigns the reference number of 2870 to the shilling, associates the lion mintmark seen on the coin with the mint at York where it was made, and provides an image of an example on page 287. The coin is also identified in Sutherland’s English Coinage, with an image shown on plate 94, but this example is much nicer than the ones shown in either reference. 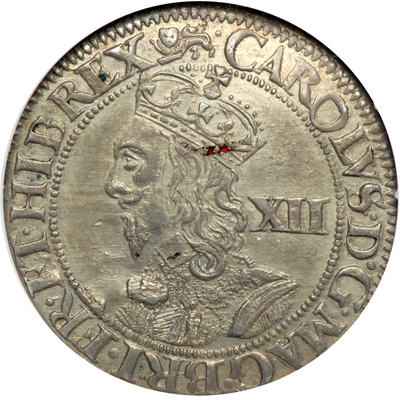 Charles I, Shilling, York Mint, 1643-4 (S.2870), type 1, crowned bust left, with scalloped lace collar and value (12 pence) behind; lion mint mark on both obverse and reverse. Reverse: long cross fourchée upon a quartered shield of arms with “EBOR” above (Eboracum, the ancient fort and city in Roman Britain that eventually became known as York). On the eve of the English Civil War in April 1642, civil unrest made London too dangerous for King Charles I to remain, so he moved his court to York, effectively establishing it as the English capital until August, when he declared war against the rebel Parliamentarian forces and departed to establish his court at Oxford. York continued to serve as a Royalist base of operations in the north and the Midlands, and it was during this period that one of Briot’s provincial mints was in operation in the city. A Parliamentary army under Lord Fairfax, seeking to eliminate Royalist strength in the area, defeated a Royalist force at nearby Selby on April 11, 1644, and placed York under siege. Although a Royalist relieving force under Prince Rupert of the Rhine was able to raise the siege, Rupert unwisely sought battle outnumbered and was decisively defeated at the Battle of Marston Moor, leading to the fall of York and the collapse of Royalist strength in the north of England. Nicolas Briot was the French engraver-general at the Paris mint whose artistry and flair for improving upon the minting machinery that had been introduced to France from Germany earned him considerable jealousy and resentment. Accused of fraud, Briot fled France to England in 1625. Luckily, Charles I was already displeased with the work of Edward Greene, his chief engraver, and in Briot he found the very man who could both design his coins and supervise their production. Within a year of his arrival, Briot was engaged to engrave a new Great Seal of England. In 1628, he became the designer of Charles’ portraits for coins and medals, and by 1629, he was using his innovative machinery to strike coins. No one really knows how Briot made his English coins, but a good guess would be a further development of his French coining machine. It is certain that this particular shilling was made by Nicolas Briot at York, but the exact configuration of the machinery he used to make it is unclear. During the war Briot often moved, setting up temporary facilities to mint emergency coinage in several provincial cities, and the machinery he used seems to have varied from place to place. Meanwhile Parliament, controlling much of the southeast, continued to mint coins in London bearing the king’s image. Accounts indicate that Parliamentarians seized some of Briot’s machinery at Scarborough while it was on the journey north to York from the Tower of London. Chaliss’s New History of the Royal Mint suggests Briot used cylindrical dies at York, operated by hand, through which a metal strip was fed; a process not used at the Tower. If this was the case, Briot’s machinery must have had features similar to one of the German roller dies shown at right. As the saying goes, all coins have a story to tell. This one, the product of a turbulent time of political and numismatic change, has a much more interesting story than most. My thanks to Bruce for sharing it with me and giving permission to share it with you here. C.E. Chaliss: A New History of the Royal Mint. London: Cambridge University Press, 1993. “The Coining Technology Heritage Project,” www.segoviamint.org (Multiple coining machinery images.) Accessed 8 February 2010. Ira and Larry Goldberg, Money of the World: Coins That Made History. Atlanta: Whitman Publishing LLC., 2007. “History of York,” www-dot-historyofyork-dot-org-dot-uk, a website exploring York’s history, provided by a partnership led by York Museums Trust, supported by Yorkshire Forward and City of York Council. Accessed 8 February 2010. Spink & Son: Standard Catalogue of British Coins, Coins of England & the United Kingdom. 47th Edition. London: Spink, 2012. C.H.V. Sutherland: English Coinage, 600-1900. London: Batsford Ltd., 1973. Image of the Jacobean chest of drawers is from MacKenzie Galleries & Commercial, http://www.mckenziegalleries.com/. 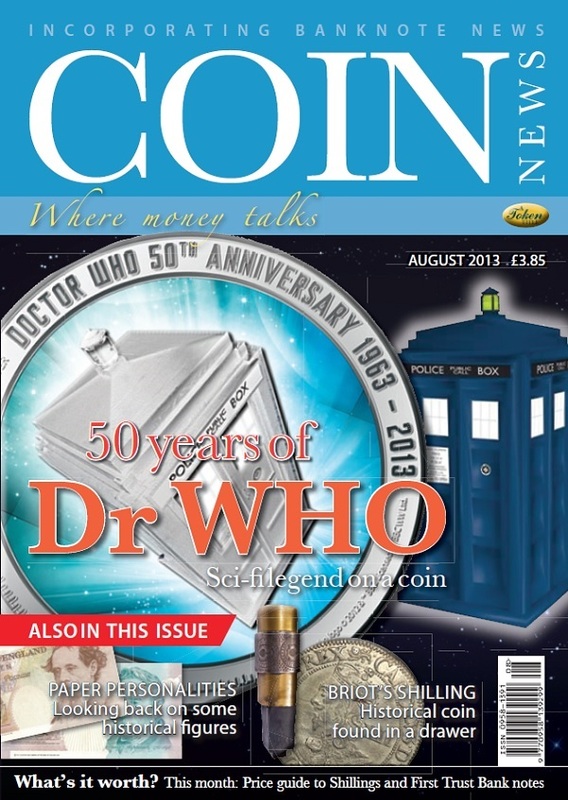 This article appeared in the August 2013 issue of Coin News. This entry was posted in Coins, History and tagged Coins of England & the United Kingdom, shilling, York. Bookmark the permalink.